Well, its taken almost two years, but I finally felt comfortable leaving my son overnight. You know what that means! Girls night out! Of course, now that we are older and have more responsibilities ranging from motherhood, to traveling the country for work, to working through law school.... we had to plan this outing quite a few weeks in advance just to find a date that worked with everyone's schedule. I had been looking forward to this night of "freedom" and also to staying overnight at one of the most well known hotels on International Drive in Orlando. 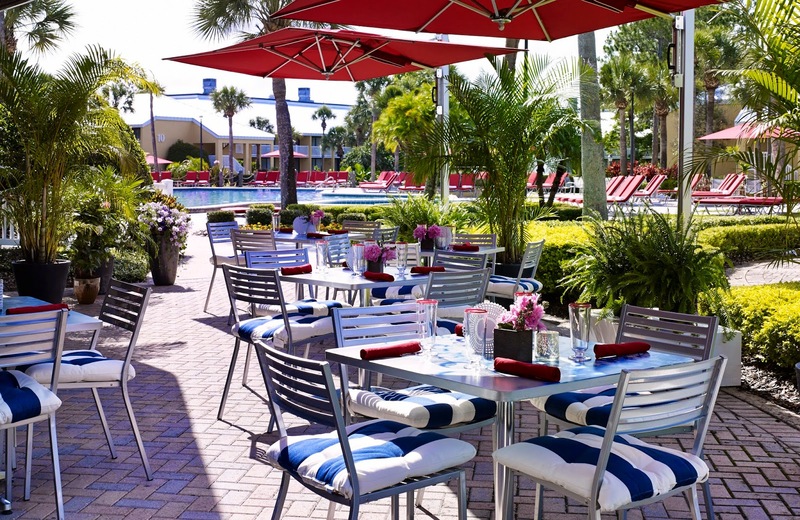 The Wyndham Orlando Resort International Drive recently underwent a multimillion dollar renovation and I couldn't wait to see all of the new features. "Renovation" doesn't even begin to describe the amount of work that has been done to this resort. The entire property has received a complete makeover and has been completely redone. I never really knew how big this resort was until I checked in. There are many different accommodation options ranging from deluxe rooms to one bedroom suites to, my favorite, the family suite. This suite configuration is certainly one of the property's most innovative and unique features. 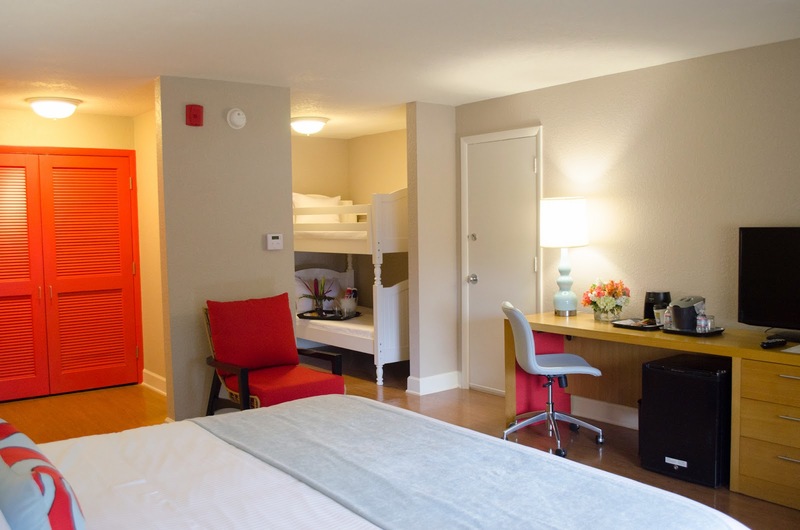 This large suite features a separate enclave with bunk beds and bean bag chairs to give kids their own space without having to pay for a separate room. Other treasures I discovered while exploring the property? A swimming pool, one fabulous pool bar (we will get back to that later), a contemporary lobby bar, a small playground for children, and a gift shop that sells ice cream, Starbucks coffee, candy, snacks, liquor, and even beachwear. The hotel itself is located on a prime section of the attraction filled International Drive. Within the past couple of years this area has grown and undergone many changes. Many new restaurants and bars have been added to this strip of the road. New entertainment complexes, including Mangos Tropical Cafe Orlando and a 400 foot Ferris Wheel, are expected to open next year. For families looking to visit Orlando's theme parks, the Wyndham Orlando Resort International Drive is just two and a half miles away from Universal Studios and minutes away from Walt Disney World thanks to a quick drive on the nearby Interstate 4. All of this only adds to the value, versatility, and convenience of this hotel. Some of our beauty supplies for the evening. After spending sometime exploring my new home away from home for the day, I went back to my room to relax before the girls arrived. Once the ladies were in house, the beauty part of our evening begun. There is nothing quite like getting ready with your girlfriends for a night out. Makeup, mirrors, the smell of hair styling appliances... its all part of the fun. We required a ton of beauty products for this special occasion (which I will touch on in detail at a later date.) However, some of our favorites were COVERGIRL's Ink It! eye liner and Flamed Out Shadow Pots, Mally's Volumizing Waterproof Mascara, and our array of MAC Lipsticks. We decided to start the night with a few drinks at the hotel pool bar. This ended up being one of the best parts of our night. Our bartender, Justin, not only made excellent drinks (I had the strawberry mojito and it was delicious), he was also great company. We ordered nachos to share and were surprised at how generous the portion was and how fresh the ingredients were. As we sipped on our drinks, took bites of our food, and enjoyed interesting, silly, and entertaining conversations we completely lost track of time. We had spent two hours at the pool bar without even realizing it. So knowing we had to move on to our next adventure of the night, we said our goodbyes to Justin and headed down to Cooper's Hawk Winery and Restaurant, which is conveniently attached to the hotel. Cooper's Hawk is an elegant restaurant that offers wine tastings and serves decadent dishes. We enjoyed dinner, tasty sparkling wine (I recommend the Almond) , continued our conversation and started to map out our plan for the night. Originally we had planned on walking from bar to bar since we were centrally located to all of the places we wanted to visit. But, you know, Florida weather is a funny thing. And it was raining all night. So we decided to use the Uber app. Now, I was skeptical about this app. It seemed scary and dangerous. But honestly, the Uber drivers we had the pleasure of meeting were some of the most professional car service drivers I've encountered. And I would definitely recommend using Uber if you're out with a group and unexpectedly need a car service. The places we ended up going? First we went to Cafe Tutu Tango, a unique bar decorated with artwork created by local artists', then we decided to go to Senior Frog's and do a little dancing, then from Senior Frog's we went to Ice Bar. Ice Bar is known for having the largest permanent ice bar in the world with over 50 tons of carved ice. There is another area of the bar called the "Fire Bar" that is modeled like a more traditional dance club. We elected to stay in the "Fire Bar" and enjoy a chocolate pretzel shot because of the rainy weather. No one wants to spend girls night cold and wet. This is where we danced, laughed, and ended our night out. On the way back to the hotel we decided to take a RediPedi, or bicycle cab. It was surprisingly quick and before we knew it we were back in the comforts of our home for the night. This is where I discovered my mom super power. We were all exhausted and ready to get under the soft blankets in the plush, pillow covered Wyndham beds. While the other girls did their short cut beauty treatments, I went through my entire bedtime beauty routine (shower and all) knowing my skin would be angry if I didn't. Once I completed my beauty routine, I walked into the room to find both of my girlfriends asleep in bed. I continued to clean up the room and pack, only leaving out the few items I would need in the morning. And this is when I realized motherhood came with a super power. Ready for it? The ability to fully function and do what needs to be done in a very tired state. Before I had my son I had done exactly as they did after a night out. Quickly washed (most) of my makeup off, changed into pajamas and gone to bed. But now, I had a checklist of things I wanted to get done before hitting the sheets. After one of the best nights of sleep I've had in a long time, we woke up and decided to order room service for breakfast. Within 20 minutes a friendly face was at our door with eggs, bacon, ham, coffee, juices, and breakfast potatoes. I enjoyed my breakfast in bed and even stayed in bed to enjoy a movie as the girls left. Because of the hotel's late check out option, I wasn't scheduled to leave until the afternoon and had every intention of soaking in my last bit of relaxation. Then, once the movie was over and my bags were completely packed, I headed out. Back to reality for this mama but I will definitely be back to the Wyndham Orlando Resort International Drive when its time for another mini-vacation. Maybe I will even bring the family next time!